How was your weekend? It was fun, relaxing, and full of enjoyment, Right! Then why are you looking anxious and sad? This is one thing that happens with most of us on every Monday. Despite having so much fun, shopping, hanging out with friends, and doing what you like the most, we feel depressed and unwilling to head towards another week full of work. This ‘Monday Morning Blues’ is a common thing. After long hours of work and multiple stress triggers we probably get one or two days of relaxation and before realizing their presence, the weekend expires. Hence, it is again time for another week loaded with work, late hours in the office, skipping meals, and most importantly lacking enjoyment. So, is there any solution to this? Yes, there is not one but numerous ways through which we can combat Monday morning blues completely. So, want to know these ways? You need to just read this post until the end! The very first thing you need to do is know what is wrong with you. Ask yourself. If you feel Monday morning blues most of the times, then definitely this is something serious that needs to be addressed properly. One way to do is to prepare a list of things that break you down at work. Is it a negative co-worker, or your stubborn boss, or the high stress of work, or maybe anything else, you ought to identify the problem. Once you get clarified with what is bothering, you can try to figure out solutions for the same. This is a way of self-empowerment and improving the situation. Maybe one reason for feeling blue on Monday morning can be because of stressful hours loaded with work. If you have piled up work, then Monday can be definitely challenging. A great way to combat such anxiety is to complete all your pending tasks and dreadful assignments on Friday. This way, you will end your week completing all the assignments. Moreover, it will support you in having a head start of the next week. If your mind is free from any unpleasant tasks or situations, then you will enjoy starting a fresh week with something new and interesting to do. One mistake that most of us often do is to look at all the tough things the coming week is going to bring of us. So, why not to think about it alternatively? Turn it around and make a list of at least 3 things that you enjoy at work. You can practice this exercise on Sunday afternoon or evening. This will add some positivity to your thoughts. If you are not able to list even 3 such things, then definitely you need to make some changes. While work is surely demanding, stressful, and can be hectic, it is essential that it must be equally fun, or at times enjoyable. If you are going to reply to an email on Monday, then why to have a look at it on weekend! Be it your voicemail, emails, online messages, or your company’s social media account, avoid checking them on weekend. Undoubtedly, it is tempting to know what the other day is bringing to you, but most of the times you end up wasting your present for the future. So, make it a habit of leaving your office problems in the office and keep your personal life, and ‘weekend life’ away from it. If you are going to party hard on Sunday then surely this will affect your Monday. Going to bed a little early on Sunday night will help you take a good night sleep and prepare your body for the next day. So, line up all your late night parties, hangouts, shopping, and such stuff for Saturday. Just let Sunday be your day at home and the time to get absolute relaxation and sleep. When you will be lazy on Sunday, then you will be more relaxed and energetic to work on Monday. Dressing up and showing that you are ready for work brings in lasting positivity. When you appear good, you feel good. Make yourself more magnetic and charismatic by dressing up in your favorite outfit on Monday. This will build confidence and might even offer you with compliments from co-workers. Starting a week with a positive attitude is just going to bring you more appreciations about the work. So, even before you head towards work you must pump yourself with positivity towards your work, the way you work. This can be done by listening to high-energy music in morning or avoiding a complaining culture in the office and improve your attitude towards others. Since your mind does not want to bear the load again or need some time more to switch back to the work mode again, so plan a light work schedule for Monday. You can plan meetings and deadlines ahead on Tuesday or Wednesday. This will make Monday easier for you. Even it will help you to get back to that pace again and complete things more wisely and on time. But beware of including too much free time as this can worsen the situation. Take up your Monday at the time to do little work and to do little fun at work. You can bring donuts for the colleagues, or can plan a small lunch with your co-workers. Even you can have frequent 10 minutes break to let your mind feel relaxed and refreshed. Share your weekend experience with your co-workers as this is really fun. Also, it is an excellent way to strengthen your network within the office. If possible, then you can plan up such things on Friday with your team so that everyone looks forward to it and feels excited. If you want your Monday to be equally exciting like your weekend, then planning some small event post work can be a great way to stay energized throughout the day. Catch up to your favorite dinner, catch up on a TV show that you really love watching, prepare yourself something special, or anything that makes you feel refreshed. Just try this one out, as it will not cost your work and will even be relaxing and enjoyable. If you are among those who plan to enjoy only during weekends, then this is something that may reinforce negative feelings within you. Also, it can create unreasonable expectations for the weekend. Hence, instead of considering this as the only way to live life, try to enjoy in everything you do. This way it will be ensured that you don’t feel pressured to make most of your weekend and feeling bored during weekdays. Consider each day equal and think it in a way that you can enjoy during any day. Working uninterruptedly and without complaining about complete 5 days is too long to have a break. You can set your own rules and think of having fun and relaxation during the mid-week. This will not just unwind your energy, but will also give you time to enjoy and manage things in a much simpler way. Your mid-week break can include anything, a family movie, your favorite sport, dining out in your favorite restaurant, or simply sleeping for one more hour. While this might be something you will not agree initially, but practically speaking, this is good for the body and for your entire day. Stick to the same sleeping schedule even on Saturday and Sunday. You can sleep an hour late on Saturday, but wake up exactly at the same time. This will keep your mind at peace. What to do the remaining day? Once you are done with all your work, you can sleep during the daytime, stick to lunch with your friends, go out for an evening walk, manage your home, or do something that you were not able to do during the entire week. This is one thing that you can practice during any day of the week. If your mood is upset or you are feeling a little low, or something is troubling you, then all such situations can be overcome by simply listening to energized and lively music. Just play music loud in your house, while you get ready for your office, or you can play live music in your car while driving to the office. This will surely lift your mood high. 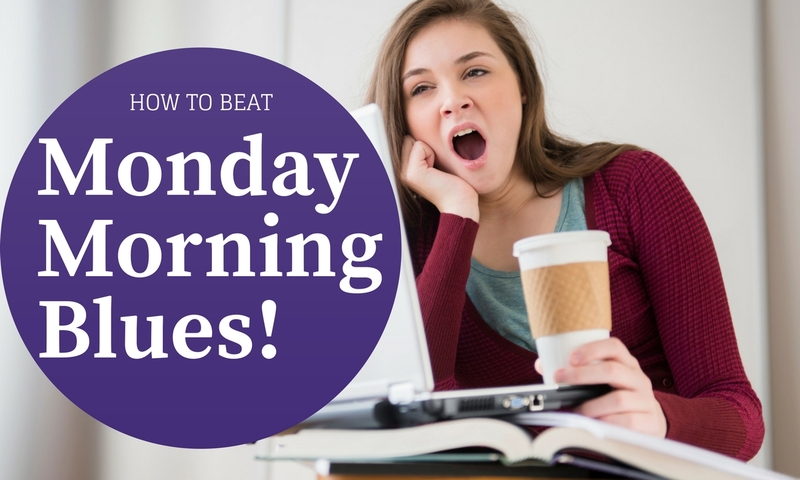 This is another unique and amazing thing that you can do to avoid Monday morning blues. Yes, exercising actually boosts up the endorphin levels in the body. Hence, you may get up early morning during the weekend to give your day a new beginning and to prepare your body for the next coming days. Exercising is something that will keep you charged not just on Monday, but throughout the week. If you can’t go to the gym, then even a morning work will do all the work. Flowers are beautiful, colorful, and lively. You can either place your favorite flower on your desk every Monday morning or can bring a small green plant. This will bring in the much-needed life and liveliness needed on Monday. As per expert psychologists, the green color is pleasing and soothing to the mind. Even when individuals are stressed with lots of computer work then the presence of plants can enhance the entire environment and make them feel less stressed. Also, plants are good for maintaining low levels of blood pressure. It will result in more productivity and less stress. If you don’t want your Monday to get wasted in just cleaning and managing your desk, then make sure you keep it organized on Friday itself. An organized desk is always welcoming. Even cluttered desks are proven to increase the stress levels. Hence, make sure you keep things intact and in place. You may feel stressed on Monday if you still have lots of things unmanaged at home. So, if you don’t want your weekdays to get wasted in performing additional tasks of home, or other than the office, then try to complete everything on weekend. From organizing your wardrobe to cleaning your walls and glasses to servicing your car, to going to the salon, there is lots of work to do on weekend. So, just keep a check of those as well and avoid doing any work on the weekend. When things seem more manageable, then you will love going to the office on Monday and will overcome the problem of Monday morning blues. What you eat is what you feel! So, give your Monday a kick start with a hot shower. This will reenergize your body and make you feel fresher. Follow this with a bowl of the healthy meal including everything you love. While hot shower will stimulate your senses, healthy meal will ensure that your tummy does not cramp with a feeling of being hungry. Monday morning blues is a very common thing and almost every other individual experiences it. But with these ways, you can overcome it and enjoy your Monday like the remaining days of the week.